Kendrick Press, 2007. Paperback ISBN 0-9740427-6-5 (vol.1), 0-9740427-7-3 (vol.2), 0-9740427-8-1 (vol.3), 0-9740427-9-X (series). Hardback ISBN 0-9793183-1-9 (vol. 1), 0-9793183-2-7 (vol. 2), 0-9793183-3-5 (vol. 3), 0-9793183-4-3 (series). Volume 1: xviii + 539 pp. Volume 2: xii + 553 pp. Volume 3: xii + 597 pp. Price for each volume is $70 (paperback), $105 (hardback). For many phenomena of the real world, observations in the past and present may have considerable influence on observations in the near future, but rather weak influence on observations in the far future. Random sequences that satisfy "strong mixing conditions" are used to model such phenomena. 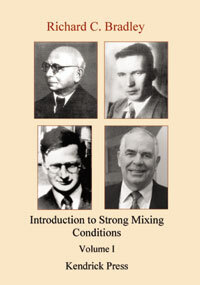 This three-volume series is an introduction to the theory of strong mixing conditions. All three volumes deal primarily with (1) the central limit theorem under various strong mixing conditions and (2) basic structural properties of strong mixing conditions. Well-known constructions from the literature are used to illustrate various subtleties and limitations in connection with both the central limit theory and the structural properties involving such conditions. The proofs are given in much more detail than in most papers and monographs, in order to help newcomers to the field. The main prerequisite for the study of these volumes is a graduate-level command of real analysis and measure-theoretic probability theory. Richard Bradley is Professor of Mathematics at Indiana University. He is an active researcher in the field treated in this series.